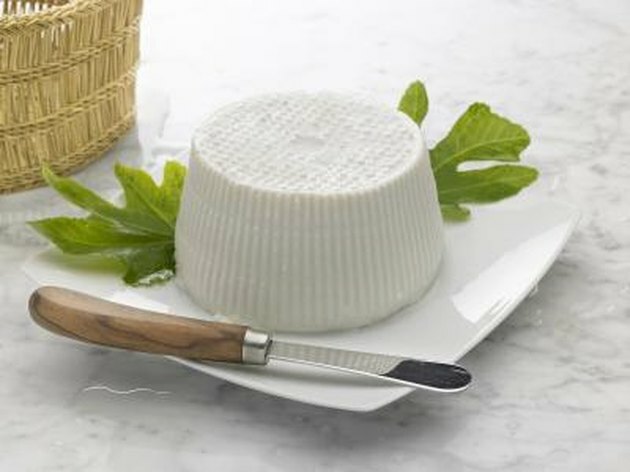 Some types of soft cheese are unsafe for consumption during pregnancy because they may contain a bacteria called listeria. An infection with the listeria bacteria, called listeriosis, causes mild flu-like symptoms in the mother. Listeriosis has more serious consequences for the developing fetus and may result in miscarriage or stillbirth. Fortunately, pasteurized ricotta poses no risk during pregnancy and can be part of a healthy diet. Ricotta cheese is an excellent source of calcium -- a mineral essential for your unborn child's bone and tooth development. Additionally, ricotta has 14 grams of protein per half-cup serving. A protein-rich diet will stave off hunger and help you to make it through your pregnancy without putting on too much weight. Ricotta contains a long list of other healthy nutrients including folate, phosphorous, potassium, vitamin A and vitamin D.
While ricotta cheese is relatively nutritious, it's also energy-dense. A half-cup serving of part-skim ricotta has 170 calories, so be careful to exercise portion control. Avoid whole-milk ricotta, which has a heavy fat content. Limit your consumption of ricotta and other cheeses if you are on a low-salt diet due to pregnancy-related hypertension. A single serving of ricotta cheese has 123 milligrams of sodium. BabyCentre: Is it Safe to Eat Cheese During Pregnancy? Is Mozzarella Cheese Okay for Pregnant Women to Eat?